We all know that garage doors can add curb appeal to your home, but did you know they can also improve your overall property value? 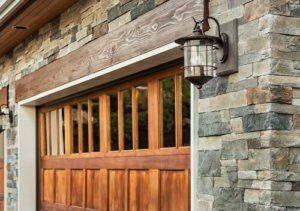 If you are thinking about updating or replacing your garage doors, consider some of these factors to get the most for your money. Real wooden doorscan offer a classic look. While every so often they may need a fresh coat of paint or staining, they are a great complement to any architectural style. Steel doorscan provide a classic design, as well as a traditional carriage house style. This material is very durable, and needs only minimal cleaning and maintenance. Vinyl doorsare a longer lasting option, and well suited to areas that undergo severe weather. They are rust-free, dent resistant and hardly ever need repainting. Fiberglass doorsboast the look of real wood with a natural grain appearance, however they are constructed of durable steel. Aluminum and glass doorscan offer the most sophisticated look, and offer a variety of options. Keep in mind: while aluminum doors require no maintenance, they do not have the same level of insulation as the other doors. There are a wide range of window design options for today’s garage doors. The advantages of including windows in garage doors can be realized when you notice the visual effect, and also appreciate the ability to see outside, allowing natural light to stream through and brighten the space. When it comes to garage doors, safety has always been paramount. Furthermore, with spring loaded mechanisms that are under tremendous pressure, automatic features have built-in auto-stop and auto-reverse functions. The bottom brackets also are now made tamper resistant to reduce risk of injury. Additionally, pinch-resistant features are designed to push objects – think fingers – away from harm should they be accidentally placed too closely to the moving door. Finally, in the event of a fire, the polyurethane insulation adds improved fire safety as it performs as a barrier in reducing the amount of smoke and flames. In the past, a garage was seen as simply a place to park your car and maybe stash some tools and the lawnmower. Times have changed. Garages aren’t simply for housing vehicles anymore. They can serve a wide variety of purposes, from providing lots of extra storage to serving as a workshop. Contact us today for details about how we can help with your garage remodeling in Phoenix.